Jack Harty with Harty Capital, is a commercial lender that I have used and he is pretty good at passing on information that can effect lending. Below he describes that once unemployment reaches 6.5%, we will likely see a rise in interest rates. Good news is that we see that Ada County (Boise, Garden City, Eagle, Kuna, Meridian, and Star) is at 5.5% as of January of this year. Below is Jack's informal announcement along with some graphs which I think is very informative. Unemployment isn’t bad in Ada County - 5.5% for January. February National Unemployment rate is down to 7.7% (per standard U3 measure), but the U6 measure of Unemployment is still high at 14.3% (includes those who work P/T but want to work F/T, plus those who've dropped out of the labor market). Thus, as more jobs are created (Feb job creation saw strong net new job creation of 236,000) more people will return to the labor market from their positions on the sidelines. They will then be counted as unemployed while they look for one of the 236,000 new jobs. That will have the affect of slowing the decline of the unemployment rate, or even increasing it, as occurred between December and January - 7.8% vs. 7.9% respectively. So what?… the importance of the U3 Rate is that the Fed has declared that it will maintain "accommodative" (read: low) interest rates until national unemployment stabilizes at 6.5% per the U3 Unemployment Rate. It is hard to predict when national unemployment will reach 6.5% due to the push/pull effect of people who've dropped out of the labor market (see U6 Unemployment Rate) and then return to the labor market as jobs are created. 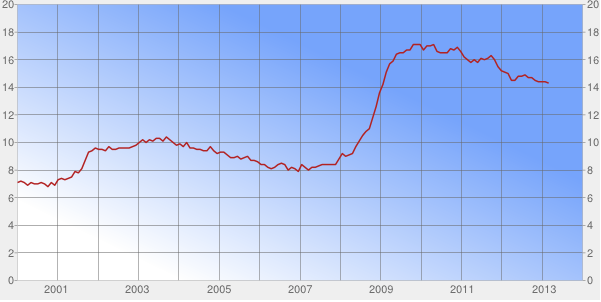 Those people will tend to dilute the unemployed pool, probably retarding the rate of unemployment decline somewhat.